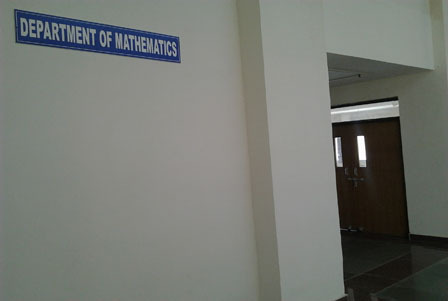 The department of Mathematics has 14 faculty members specialized with pure and applied mathematics, Statistics and operations research. The faculty members are actively involved in research activity in the areas of Mathematical and Physical modeling: Computational Fluid Dynamics, Cosmology & Relativity, Differential Geometry and Optimization, Dynamic Optimization, Functional Analysis and Graph Theory, Algorithms on Graph Theory, Mathematical Analysis and Applications, Mathematical Modeling of Biological systems, Financial Mathematics, Multivariate Analysis, Theoretical Seismology, Elasto-dynamics, Elastic Wave Propagation. In 2013, the faculty members have already published 20 research papers in national and International Journals and also received sponsored project of Rs. 20 Lakhs from various funding agencies.